Place the fish fillets in the centre of a large piece of tin foil. Spread the curry paste over each fillet. Evenly sprinkle the coconut, lime zest and juice and soy sauce between each fillet. Bring up the sides of the foil and scrunch the edges and sides together to make a sealed parcel. Place the parcels on a baking tray, put into oven and bake for 20 - 25minutes until fully cooked. In a pot of boiling water, add the frozen peas and cook. Place the rice in a pot of boiling water and cook until light and fluffy. 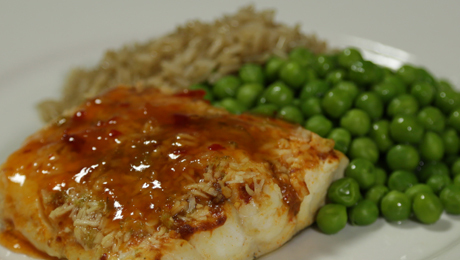 Serve the fish with the rice and drizzle with sweet chilli sauce and peas on the side.